Update from private beta worked fine. Win 7 prof. with Outlook 2013. First impressions are i like it. 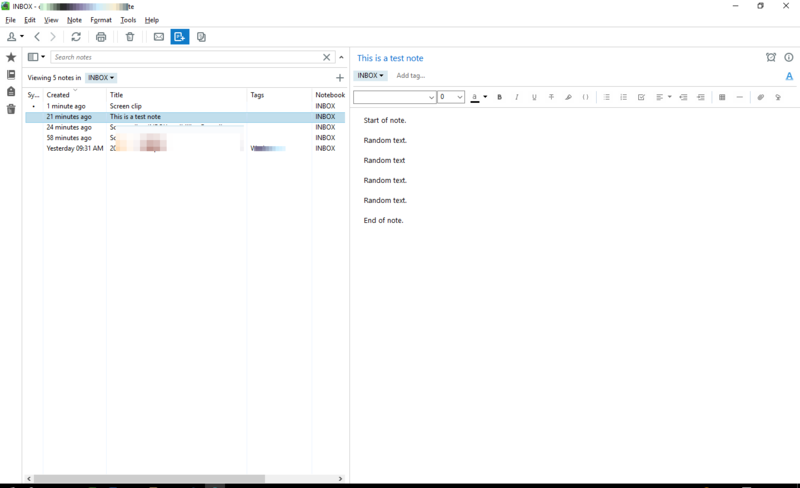 I see the new procedure for moving notes from a business to personal notebook or vice-versa is now right-click and copy to personal, would it be possible to have the option to cut and paste the note rather than or as well as copy. Now when using the copy function there is an extra step needed to physically delete the note as well, which means (because I like to double check) I have to go from the business notebook to the personal notebook I have copied the notes to in order to check they are present, I then have to go back to the business notebook and delete the notes I have just copied. First impressions are quite nice. Just a little thing is that I don`t see the total number of my notes, only the number of notes in each notebook. Would be nice if I could see the total number of all notes again. Update: As nobody else mentioned clipper-problems, I had a closer look at Outlook. The clipper-add-in was deactivated, I assume by one of the prior private betas. With the official beta, I could reactivate the add-in. When I toggle off the formatting bar and I switch to another note I have to toggle it off again. Would be nice to keep the status until I change it. Would be nice if I could show the creation date of a note at the top of the note again. When I save a document in a note I change the creation date to the date of the document. When I have to open the information menu, it is a click more each time. Just found that there is an option "always show note editing toolbar". Turned it off. Now it works perfect. And: no more overview page for notebooks and tags? Only the sidebar? When you hover over notebooks and tags in the note a little right arrow appear. When you click it, it loads all the notes assigned to them. I really like the option to show notes in a notebook by tags. If I am able to show all notes this would be even more helpfull. Just found to see all notes. Hm ... where is the reminder icon/feature??? Please click the down arrow at the right of the search box to show Search Info box -- it has the note count for the current search which equals to your total note count when you display all notes. What i happily saw: if you press [alt] and a letter, the menu remains open - example: i want a classic link without clicking -> i type [alt]+[n] and then [e] - now the "create evernote link" entry is highlighted and i have to options: enter for a web-link OR [ctrl]+[enter] for a classic link. Thats flexible and handy. Tip: if you Shift+Click the area to the right of the "Add tag..." text, the note's notebook and tags will be added to the search. This allows you to quick bring all the related notes into view quickly. Typical use case is: you found a note by searching for it or scrolling, now you want to see all the related notes in the note list. F4 repeats last text editing action, so you don't need to reach out to mouse or press Ctrl+Shift+X repeatedly... also dubs as a character format painter. Ctrl+Click on Select Notebook arrow in Note Info selects the notebook without clearing the search filter, useful when you want to keep the search context but still need to change notebook. Shift+Click in the notebook/tag area in the Note Info selects the note's Notebook/Tag context, useful when you need to show notes with the same notebook and tags in the notelist. Pressing up/down arrows in Search Box opens or closes Search Info box. We should certainly find a better way to expose these shortcuts. Ink Notes are there! Please customize your toolbar to put the New Ink Note button back. My bad - in which case Super! Thank you for posting these useful tips. F4 ... great idea! I like the cleaner UI but making it ALL white it's kinda shocking to the eyes. I remember when you released V6 in OS X there where lots of complains with the bright UI but here you go a step forward and make it ALL white, not even a little gray. This is a personal opinion, would like to see a little more life and contrast in the UI. Nice to have the option to shrink the left bar! Even nicer to finally be able to select a parent tag and view all the notes of the children tags!!! In the card view, if the note has a title and pictures it shows the title in a blured background over the image. If the note has title, text and images it shows the title and text in a white background above the picture. Personally I would like it better to get more consistent look and ditch the bured background in favor of the white one. Something I was expecting to see replicated from the OS X app was the bold titles in the note selector, it makes it easier to focus on titles with a quick look. - If you select a parent tag and move it, it will destroy your whole tag hierarchy within the parent tag due to the fact that a single click now also selects all the child tags. I suggest that you pull the beta before this leads to major problems as there is no undo..
- I can't find saved searches. And is the removal of tag and notebook searches within the search bar on purpose? - I miss the tags/notebook views. Was a great feature to be able to drag and drop from the view into the panel on the left. 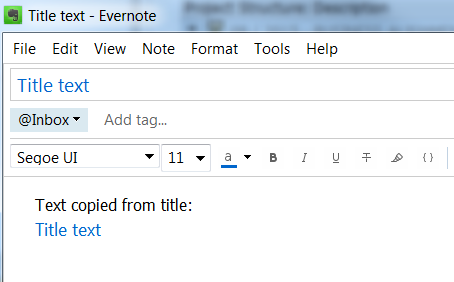 - I still miss the feature where evernote would search inside existing tag names when adding tags to a note. It would greatly help to prevent duplicate tags. - The note title field and the note itself (text editor) still doesn't support emojis even though the left panel and the note list does. Update worked fine, a bit of a pregnant pause right after EN opened, but one minute later off and running. View hot keys are changed. Can't find Shift-Alt-T for tag search. Probably right in front of me, but the key combo does not work for sure. Miss the dates in note header. Never used the left panel that much anyway, is there a way to get rid of the ribbon that is there now. In any case, if you have a tag hierarchy the ribbon doesn't provide much function. Shortcuts combined with toolbar means less shortcuts available for one click access. Like the note title sticking again. EDIT Do saved searches still exist in this new version? So first impressions, hopefully speed, reliability and improved editing experience combined with much blander and probably a bit more work to accomplish the same tasks, without much in the way of functional improvement (encryption, reminder date as a column, any of the other items that appear multiple times in the forums). Not trying to be rude, just trying to be sure I get it. I do appreciate the effort you and your team put into the product. Soon you will be able to click Search icon on the Notebooks item, or just press Alt+F1 to open Notebook Picker, type in first few letters of the notebook name, then rename the notebook. In this beta renaming the notebook from the Notebook Picker does not work yet. Looks pretty good but disappointed 2 of my requests did not make it. ie. Ability to add the Reminder as a column in List View mode and no "Free flow" sort where I can click and drag notes in the order I like. I know the Reminder as a Column has been requested before and I'm surprised that could not make it in this build.. I'm also trying to "Add another User", but get "Could not connect to the service. Please check your Internet Connection or try again later"
Please stay with the two general view pages for notebooks and tags. Yes, you have a lot of function in the sidebar now. But with the sidebar I have to scroll and scroll, to expand the notebook tree, expand the tag tree, close the notebook tree for more space and ... and ... and. The very best solution is build in the Mac version (and was at the beginning of version 5 Windows too): one page with multi columns for notebooks and one page with columns for tags. Ability to add the Reminder as a column in List View will be implemented for the next beta, we're already working on it. We're still investigating feasibility of your second request. If you select a parent tag and move it, it will destroy your whole tag hierarchy within the parent tag due to the fact that a single click now also selects all the child tags. I suggest that you pull the beta before this leads to major problems as there is no undo.. The way it works here is: if you click and drag the parent tag to another location, it moves the parent tag with all it subtags, preserving the hierarchy. However, if you click the parent tag first to select it and all its subtags, then release the mouse button, then click and drag the selected tag and subtags to another location, all the selected tags become children of the drop target, which is actually quite useful. Alt+F1 and Alt+F2 open the Notebook and Tag Pickers respectively. We're considering an option to show shortcuts on a separate line: some users want more shortcuts, some users like more vertical screen real estate. That's not the full picture though, because if a (parent) tag has already been clicked without you remembering/noticing, and you click-and-drag another parent tag that you want to move, if moves both tags without preserving any hiearchy for the first tag. Your example demands that you know to remember to deselect any tag by clicking outside the left panel, before moving any relevant (parent) tag. I agree that the function can be useful in some instances, but I think that a Ctrl/Shift click to include selection of all the child tags should be implemented, or at least a deselect of previous tags when clicking another tag to drag-and-drop. Also I seem to be having some issues with syncing styles. Either I get a sync-fail, or it says sync completed without actually syncing the styles and preventing further style changes. Example below shows me trying to sync 256 item styles which results in a sync-fail. I then remove style from 1 tag, and it says sync completed. I then added 2 more styles, and as you can see, it then tries to sync all 257 styles like the 255 styles never synced succesfully on the last sync. 17:18:50  0% Updating user "gustavgi"
17:18:51  0% Retrieving cross promotion info for user "gustavgi"
17:18:54  0% EDAMUserException: errorCode=BAD_DATA_FORMAT parameter="preferencesToUpdate"
17:19:05  0% Updating user "gustavgi"
17:19:06  0% Retrieving cross promotion info for user "gustavgi"
17:19:59  0% Updating user "gustavgi"
17:20:00  0% Retrieving cross promotion info for user "gustavgi"
17:20:06  100% EDAMUserException: errorCode=BAD_DATA_FORMAT parameter="preferencesToUpdate"
Looks like some finger stretching exercise in the future. Is there a place to see the new hot key assignments? Alt+F2 produces a vertical list of tags to select one tag. Shift+Alt+T allows the selection of multiple tags for an AND tag search.per the screenshot below. How does one get to that in this Beta? That place now is used for notebooks and tags. Also remember that there's a known issue in the filter that lists all the tags. I also think that there should be more and better info about keyboard shortcuts specially since lots of them seems to have changed. For example, side list view already existed in V5 but it was accessible only with CTRL+SHIFT+F5 (or similar), but now that shortucut doesn't work anymore. I got all excited by this because I got an automatic update at the same time as I read this. Updated, but didn't see a lot of improvements. Today, I checked the version number - I am still on version 5... Is it worth going outside the regular update pathway (I do allow beta updates), or should I wait for an update notice through the desktop version? I like the new bigger, cleaner attachment... ¿box?... don't know how to name it . First of all audio notes still have the old buggy ugly design that I try not to interact with because it tends to disappear. I can't left clic them and select them so I must rely in the contextual menu to work with them. Sometimes, when dropped, the original attachments may disappear, and sometimes stay in place; but always create any of those things. This code has definitely not been rewritten from scratch. You guys have tried to improvise on existing UI and make a few minor changes. I think, you'll have brought back some elements of Evernote Version 4 as well. The over all UI does look less appealing to me, aesthetically. but this i can agree and accept given that EN cannot please everybody. Big thumbs up to the new Editor. This definitely looks fresh and appealing, rather awesome However, I don't think the Reminder feature is yet integrated. Or i don't seem to be finding it. Thumbs up to the Code block feature. The potential of this feature when implemented across all platforms will make Evernote note management much more neater and crisper. I think the search box has come back to V4. The initial 5 second delay issue which was never resolved in Version 5 seems to have gone now. The Search box, on the top of the Note List, needs to be formatted better. Almost cannot differentiate between The notebook and the Note. The Search box on the Left Hand Side bar, for Notebooks and Tags is supper dooper fast.. Love this feature.. Woo... Hooo In total love with this implementation. More and more feedback will update. Keep up the good work. My gut feeling is Evernote is coming back to the right track. Biiiiigggg Thanks to bringing Styling across Notebooks and TAGS ... Wooo.. Hooo.. It would be immensely appreciated, if this streamlined across other aspects of the Client, for eg. While moving one Note from One Notebook to Other, when the Notebook picker emerges, it would be much easier to have the colour coding of the Notebooks visible here as well. Thank you so much. This is certainly step into right direction. I would also like to see more freedom with tables and selective sync of notebooks. The filtering is working awesome , especially the Tag search is able to pick out all the Nested Sub Tags automatically.. I'm in looouuuuv again..
... to sort notes manually?! This would be absolutly great!!! Well, since no one responded to my question of whether this beta was worth installing, and I hadn't seen any major bugs with it, I went ahead and installed it. Others have already provided a lot of comments I agree with, and I haven't looked at the details of the editor. However, I do have to say that I love that the title of the note no longer disappears when you need to scroll down. Many good features that I have seen - I can see that when I get used to the interface a bit more, I won't have much need for the left panel. Keep up the good work - you are making it harder to switch to OneNote! When clipping an article that does not have English text ( Tamil in this case), the WebClipper seamlessly does the clipping, Tagging, Organization etc. When syncing the note to EN Windows, the text appears garbled. When i synced and opened the note in IOS and Android, the Tamil text is neatly visible. I have clipper several hundred Tamil articles in V5, no Problem. I think some issue here in V6 Windows only. Searching Tags : I get a gut feeling that this search bug has been there in V5 itself, but only now, I could come across this. So, lets say I have a tag Apple Ball. The moment, i search for Ba.. in the Tag Search window, Evernote predicts Apple Ball for me. However, if i have a Tag say Apple.Ball (or) Apple->Ball, and now I try to search for Ball, the results do not come out. I think the issue clearly has to do with Apple Ball, having a space bar in between, and Evernote is able to pick out the Second word, but in Apple.Ball (or) Apple->Ball, there is no space, so EN is not able to detect Ba..(Ball). Please take a look at this problem too. Hi, Panzerkampfwagen. Your first "bug" is not a recent problem. I too, have noticed it for some time - and it can happen with English text that has been clipped from a web page. It displays differently in different systems, and on print preview. Your second "bug" is also not new. Many people have complained about the inability to search for strings within tags. The reason for the Apple Ball working is that the search looks for words beginning with, so will find it. But when there is a period, or other character, it thinks that the whole string of characters is the word that actually begins with Appl rather than Ball. Hopefully these "bugs" or problems with the underlying database structure or the search engine will be able to be fixed soon, but I am not holding my breath. That is definitely not true, as over 1000 of my tags rely on me being able to search within the tag word, as they have prefixes. I have reported this is a bug in this thread myself, and it shouldn't be confused with the previous inability to search for strings within tags when adding tags, which I have also mentioned. I agree and think this is annoying and destroys my tag philosphy. I use tags only with a category prefix e.g. pers_Fischer, comp_Fischer, project_Fischer. Searching in V5 one gets a list with proposals, tags and recently used searches even when your input is Fischer only = in the middle of the tag. A very comfortable selection of items one can choose from. In V6 this way of selected list is gone. Input "Fischer" results in nothing. You have to start with the first character and have to remember this. This matches the syntax: tag:*Fischer does not work. Hope this will me modified. There also seems to be a bug where the tag suggestions when adding tags to a note are case sensitive from the second letter on. If I already have a tag called MONEY in all caps, it wont recognize it when i start typing in m-o in small letters. EDIT: It also seems like that the three-arrow-down button for expanding/adding extra tags to a note doesn't work if there is very little space between the button and the tags to the left. It seems like there is max for 255 styles at the moment. Is this a conscious limitation? * Highlight tool could have an easy shortcut, or when selected the Highlight tool become available to mark the text until finished. Other idea: text selection holding Ctrl (like in MS Word) will help a lot to format text. But it is not enough smart search, for example: search = "(tag:A + tag:B) + (tag:A+tag:C)"
And Manual (drag and drop) sorting Tag! it would be ideal! not just by name! Updated the first post after a few hours of use. Getting used to the interface. But, still very white with little definition as to screen areas. Personal preference I suppose. Still can't find this. I realize you can use the + icon to add tags to the search, but you have to mouse click to do it. Not as quick as tag - enter - tag - enter. Also miss the floating formatting bar appearing when focus was in the note body. Now its off or on, so you have to think about it. Small change with title moving above tags and formatting toolbar. For those keep the left panel closed users, notebook select above the note list is gone but you can use the notebook select in the search area (assuming no search in play), or Alt-F1. All searches seem to be current context now, as text or tags get added the effect is always cumulative. Very nice. Changing the notebook context in a search now works for local notebooks as well. Very, very nice. Tags only appear in the search explanation if you type them there. So, text is adjusted in the search bar and tags are adjusted in the search explanation. Shift-tag from a note has been replaced with an arrow to the right of the tag. The arrow only appears when you hover. No arrow to select all tags for the note though, which would have been a nice add. Parent tag inheritance of children tags in search, nice for those with that kind of tag structure. Overall impression is positive. Still wondering about Shift-Alt-T for tag selection and saved searches. Also, publishing a list of the new hot keys and hovers would help those of us trying to test the product. One doesn't use every function every day but will across a month so having a target list would help. Thanks again for all the work. If you can't see it to the far right of the note title, right click there and select customize toolbar. Can anyone tell me where the saved searches are and how to access them? I can save a search but can't find it after i have saved it to use it again or add it to the shortcuts bar. How do I move notes from Evernote Personal to Evernote Business? I can't seem to be able to do it. Are you guys will implement a way to communicate between the two? Still no support for viewing images as attachments instead of inline. Where is this in Evernote's roadmap? Aside from that, I like the new, cleaner design and love the new tag styling options. Guys , it seems that in this version I can't drag and drop mp3 files from a note to a list in Winamp. I was able to do this in the previous versions :/ . Can someone please posts various screenshots of the UI? "Cleaner and brighter overall interface." was one of the new changes listed, I would like to try it but reading the thread seems to be all white Evernote. I remember when web beta came out and when version 5 beta came out and everybody were saying they don't want all white UI. For good reasons, I hope Evernote team learned something from their mistakes and I hope I am wrong. I don't want to comment anything in advance so I would like to see the screenshots please. Before I try. Actually can the person who started the thread include them please. It should be there from the start don't you think so? Thank you. 2. How to delete itself in single note UI(ctrl+alt+n)? the delete icon in toolbar when v5 disappear now. 3. I find some notes NOT wrap line anymore in v6, which wrap line in v5. really don't want to see horizontal scroll bar forever, like in v5. Am I the only one having the annoying thing where it does not dynamically return to the line when shrinking the Evernote windows? This issue appears on every other release... Can't you fix this once for all! Option is definitely the way to go, thanks. EDIT: You could put the toolbar to the right of the menu bar as well, it would fit nicely.... if you are looking for vertical real estate. Here you go. Side list view, shortcuts in the tool bar. Right after this I will post a shot with shortcuts in the side bar. Hope it helps. Shortcuts in the side bar. Thank you for posting the screenshot. I appropriate it. Unfortunately it seems that my fears are confirmed. When the last version of Evernote for desktop. version 5 was in beta they have made it all white interface like it is here in your screenshot. The users were outraged and wanted that to change, because it was too bright for the eyes, not enough separation between the sections and was generally too uniform. After getting lot of feedback, finally this bad idea was corrected by the final release. Than they made the new web version also in beta. Same idea, make it all white. Unfortunately even after tones of negative feedback they persisted in this bad idea. Ignoring the users. And that brings us to Version 6. Currently in beta, and you guessed it its white interface once again. I don't know if they do this on purpose or simply they are so unorganized and can't read feedback and notes from previous versions.... if true it would be pretty ironic you have to admit. Anyway, to Evernote team.... please don't make it all white user interface. Listen to the users and learn from previous projects please. Make it either optional to change colors, which is highly unlikely I would say, or make it like you did in version 5 or make it even more darker. But please don't leave it all white. Its bad user design practice. Read the comments from previous two attempts I mention. Thank you. Totally agree. I am getting used to it as I use it, but still. Lets hope they will listen to us and make the changes by the final release like they did in the Version 5 beat and final release of it. Thank you for the screencapture once again. My opinion is that if you set it up right, the white space also makes the colors, which you can add individually to to each notebook and tag, stand out both in the left panel and in the note list which makes it easier to identify. Not sure, but it appears to me that the sync after completing the editing of a note is not working anymore. By design or a bug? Also, tag and notebook styles only effect the left panel. They do not carry over into the drop downs or the note header information nor the columns in list view. Correct? shortcuts in the tool bar. Besides that the shortcuts in the tool bar seem to have a bug - in V5 and V6 as well: I have approx. 50-60 shortcuts, the first 6 or 7 are displayed in the tool bar, the dropdown button only shows the last 30 shortcuts - those in the middle are not displayed nor in other access. BTW In your screenshot I realized the note list above the selected note. In V5 you have the choice between this display as a short list and a more detailed display in the middle between left (shortcuts) and right (note) window. Can be switched with Ctrl+F5 and Ctrl+F6. This seems to be gone in V6 ? Those two options are still there. They just added a fourth one (detailed vertical) displayed above, which was only accessible through a "hidden" keyboard shortcut in earlier versions. Thanks for the stimulating tip - it is WIN+F5 - obviously still a hidden keyboard shortcut and untouched in the menues. Works well if you have the left panel open, no so much if your standard view is with the left panel hidden. Just whiter. Fortunately this is an area where EN provides us with an option. It the side list view is also accessible through Ctrl-F7. It is visible in the view drop down next to the search bar. Via this dropdown or Ctrl+F5, Ctr-F6, Ctrl+F7 one can switch over to these different views of the note list (vertical with details is new for me, sorting very easy now). Or just switch with F5 only - and get different results depending on the default (vertical or horizontal) in the beginning. A good example, tells me that trial and error can achieve very useful results. And they have changed from 5.9, eg, Shift-Ctrl-F5 used to cycle between list top and list side views, now Ctrl-F7. And Shift-Alt-T doesn't work anymore, which is a major PITA for my workflow. May I suggest that you make the arrow icon larger, or increase the space between the arrow and the tag. The arrow is too close to the X that removes the tag. In this short period of time I have managed to remove 2 tags from notes, and it's usually a hassle to find out which tag it was.. Thanks for all the great feedback. We have fixed many of the issues you've pointed out and are actively exploring some theme options for the interface to bring more life to it. Our designers would actually love to hear your thoughts on the current v6 beta, your workflows, as well as show you some design explorations. We are still looking for several more people who'd like to jump on a short live session with us. There are still several slots open tomorrow (Thursday 3/31) afternoon, and we'll be adding some more next week. If you're interested in shaping the upcoming release even more, and score some free Premium, head over here to sign up! One of the things that has always frustrated me about EN (on windows) was in the text editor there is no margin area on the left that lets you select entire rows of text (ala MS Word and nearly ever text editor). I use the text editing function quite a bit and move around text and not having this capability really slows me down. I was hoping for this feature to make it into the new version and although the left margin is indeed larger than the 5.x version the capability doesn't exist. Otherwise I echo what others have said about using a little color to separate some of the user elements. Although I do like the improved user interface. Keep up the good work! PD: Little esthetic bug I just found. With card view open and with scroll, if you change the notes panel width so to make the scroll disappear then bar will still be visible; when you reduce again the width so scroll will be needed again the scroll bar now disappear. When is the first bug fix version coming to a computer near me? There are a few bugs that I would like to see squashed in a generally much improved version of Evernote!! Steps to reproduce the issue: 1. Open a new note. 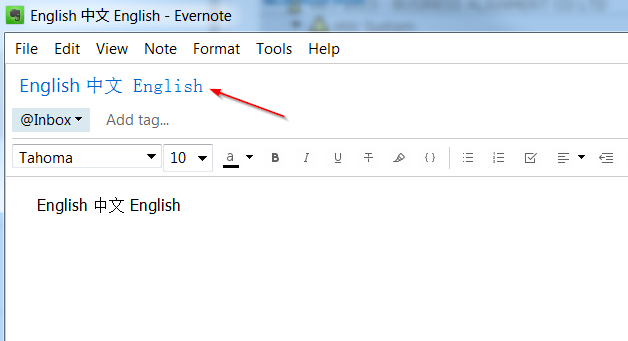 Jump right into note edit (skipping title) and enter "English 中文 English"; 2. Hit enter and the title is automatically changed to "English 中文 English"; 3. 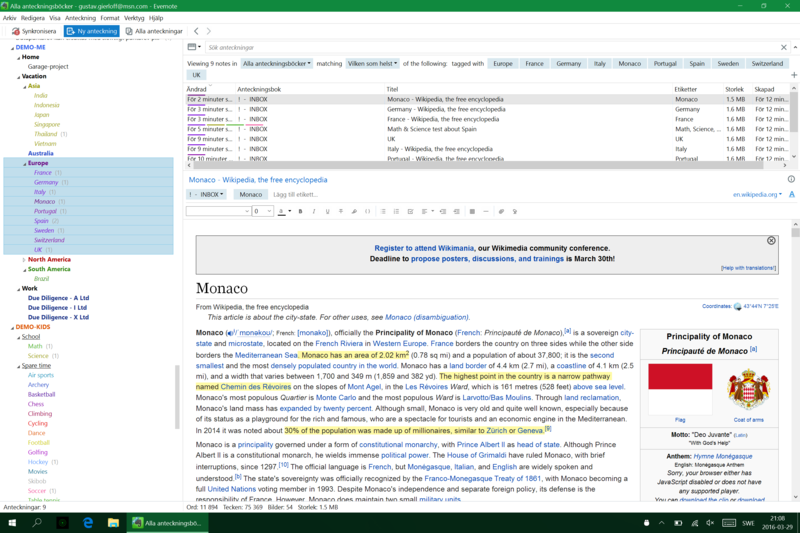 Note that different fonts are used in displaying the title text. See attached. 2. Text copied from title into the note body is blue. See attached. Although first view is positive I don't feel there is great advance respect v5. But I'm not a heavy user and maybe I'm missing something. Would like the use of background "Color Themes" in EN, to change background to tan/beige, black, light blue, white, etc. "Now the whole thing is white." Oh, I like this bright style. But it could be meaningful to built color options. Where is it possible to find the newest version of Windows 6.x Beta? Currently I use version 6.02.1349. I'm not sure what to think of the beta version. Sure it works smooth and looks nice, but why must it be so STARK white?? Nothing stands out and I get a headache after 5 minutes. Please add some color, borders, pleasantries, please! This is a note taking app, not a hospital ward! Please convey some happiness here! Functionality wise, I must say I'm a bit disappointed. I would have hoped for a much better way to clean up web clippings. For example, I would love to be able to remove background, double line spacing, margins but still keep the font options such as bold or italic, or inline images. As it is now, I can only choose between capturing the full page or the simplified article and I'd like much more freedom than that. I realize this is not DTP software but basics such as line spacing, object/text box/image placement, background options, manual page breaks and a few other basic markup features should be a necessity. Even this forum has more formatting options than Evernote! I'm on V6.0.2. The search is so much better! Just a quick question, how can I delete a tag? When I click on tags it wants me to search them, but I want to delete a tag. Request: Similar to being able to input code snippets more easily. Another interesting addition would be to have the ability to input equation symbols, superscripts, and subscripts directly into a note rather than copying and pasting. This would be really nice for students and anyone in academia who may be working on an academic journal paper that requires extensive research with equations. Equation symbols included could be the standard Greek letters often used, as well as the standard Math symbols such as an integral. Haven't tried to use 'send a copy' for multiple notes before - just looked in the new version to follow up on this posted query - seems that single or multiple selections of shared-in notes cannot be sent out using 'send a copy' (I do have editing privileges on this notebook, not sure about 'inviting others'). Sending copies of my own notes does work - a single copy is received fine. Multiple selections show "notes selected for email - x" (the number is correct) - though only the first note title/ text content is sent. I get "Email sent successfully" and the received email includes any attachments for all three emails. Which is confusing to say the least. Basically 'send a copy' works for single emails only ATM. Great experience so far working with the EN 6.0 Beta. It's refreshing. The search is fast and there are no freezes any more, that's major improvement. Small issue I noticed with ".PPTX" powerpoint presentation files, they don't show up in EN, it downs like a broken icon, but clicking on it opens the file in powerpoint fine, so the file is still there, just the icon is missing.